Elephant ear a wetland perennial in tropical climates. It is grown for both edible and ornamental uses, with over 200 cultivars available. Many offer beautiful variations in leaf color and texture for garden use. Colocasia esculenta, wild taro, is an invasive exotic in many parts of Florida. The roots, leaves, and flowers of taro are staple foods in some tropical countries, but they must all be cooked before eating. All parts of the plant contain the compound calcium oxalate, which is destroyed by cooking. Eaten raw, elephant ear is mildly poisonous and will result in swelling and burning of the mouth and throat as well as stomach pain. Colocasia produces enormous heart-shaped leaves that often reach three feet long and two feet wide in the tropics. The grow from tuberous rootstock, technically corms, which usually weights around two pounds but can weight as much as eight pounds. Under ideal conditions, a single plant can reach eight feet tall with the same spread. Even in cold regions, the plant is likely to grow to two or three feet. Elephant ears grow best in slightly acidic soil. They prefer partial shade in warm climates but full sun in cooler areas. These plants are heavy feeders. They should be fertilized weekly with a liquid fertilizer that is high in nitrogen. If they don't produce lush growth, they need more heat, more nitrogen, or more water. Elephant ears crave water. Some potted Colocasias can even be grown in standing water, and all varieties should be grown in moist conditions. Colociasias are grown as perennial garden plants in tropical and subtropical areas. They can overwinter in the ground as far as zone 8. In colder climates, the plants can be moved indoors for the winter before the first frost, or the corms can be lifted and stored after frost. Several species of Colocasia are grown as a food crop in tropical areas. Elephant ears are also greatly admired as ornamental plants. Their large, showy leaves create a lush, tropical feeling in borders and beds. 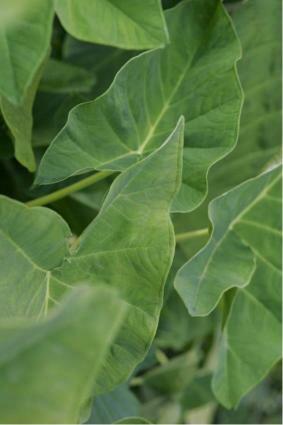 Colocasia esculenta 'Illustris' - purplish markings between the leaf veins.